Tone hunting. Something every guitar player does. You may be starting out and need that balanced tone to help your learning. Or, getting more confident and searching for ‘your’ sound. Or, more experienced and looking to add to your sonic arsenal. Wherever you are in your guitar playing journey, it’s important to explore your options. We know that you want to explore those options as quickly as possible. And testing strings back-to-back isn’t the quickest thing for you to do yourself. Fear not, Matt the Riff Master has done the hard work for you. He recently sat down for his Ernie Ball Electric String Shootout. Choosing the Regular Slinky gauge (10-46) he compares the Original Slinky, Cobalt and Paradigm sets. As you’ll see in the video, the differences could be surprising, leading you to try something new. In the video, Matt first starts on a clean channel, as he believes “that’s where you’ll really tell the difference”. And using the Original Slinky as a benchmark for performance, as he picks his way through the same sequence, one after the other, for easy comparison. First and foremost you notice a difference. Why? The Original Slinky strings are made from nickel plated steel wire wrapped around a specially tempered tin plated hex shaped high carbon steel core. Resulting in a well-balanced tone for your guitar. Treble, bass, and mids all work together with each string performing exactly as it should. There’s a reason why they’re the top-selling electric set and are favored by musicians all over the world. 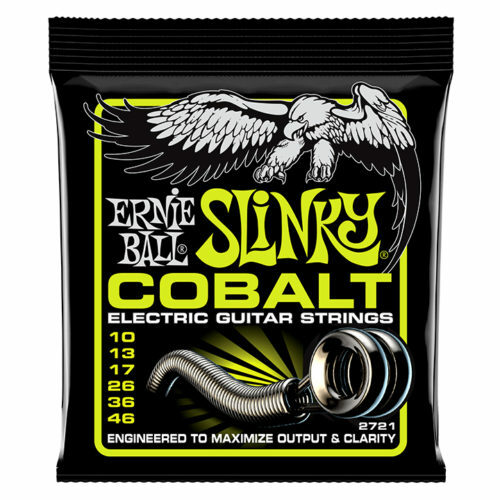 Ernie Ball Cobalt Slinky Electric Guitar Strings swap the nickel plated steel wire wrap with… you guessed it, Cobalt. It’s actually an iron-cobalt alloy to get technical. Cobalt provides a stronger magnetic relationship between pickups and strings. Which in turn provides a much wider dynamic range and a little more output. If you’re after some deeper lows, crisper highs and with a little less in the mids. Stick some Cobalts on next time you change your strings. 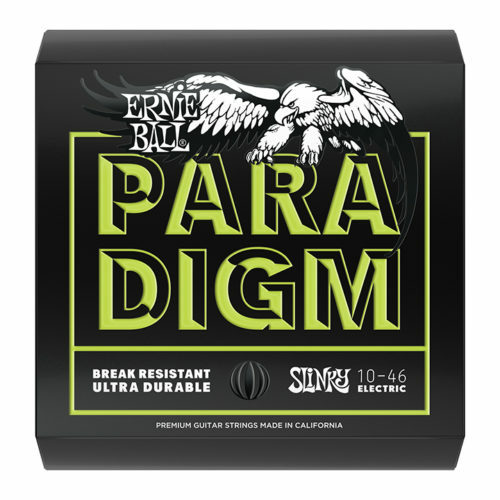 Last up Matt changes to the Ernie Ball Slinky PARADIGM set. Tonally these provide a much more balanced tone than Cobalts – much closer to the Original Slinky set. What set’s these apart is that (as Matt puts it) “They are built to absolutely take a hammering”. PARADIGM wrap wire uses an exclusive plasma enhanced process to remove any defects. It’s then drawn to gauge, leading to a more stable string. Our patented Everlast nanotechnology is applied once the strings are wound. What you get is a long lasting string, without the tone-sucking side effects of a coated string. So if you love that Slinky tone, and would love to love it for a little longer, try PARADIGM. If you want to hear some tasty heavy riffage, Matt’s got you covered with another passage where he cranks the gain. Then stick around to hear his conclusions and summary. 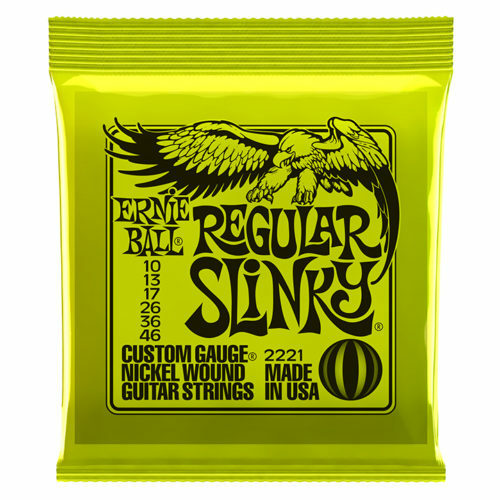 Every set of Ernie Ball has been designed to offer the player something different. With 9 sets and a host of gauges to choose from, happy tone hunting. 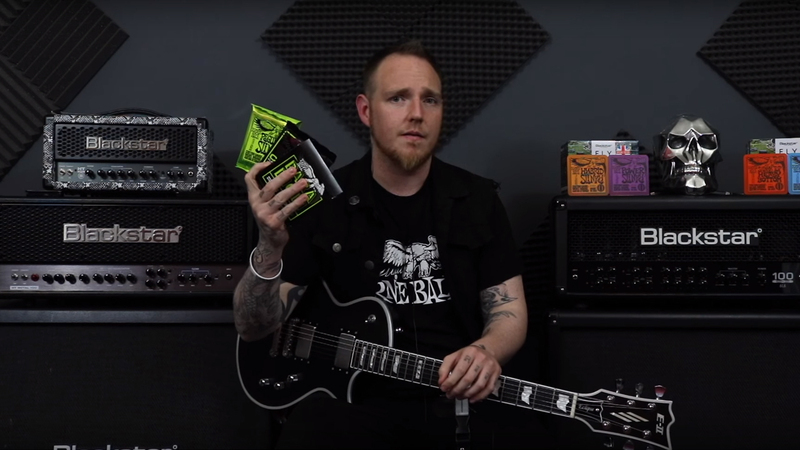 We’ll keep bringing you amazing content to help you on your guitar playing journey but the best way to stay up to date with Ernie Ball by signing up to our mailing list, or follow us on Facebook, Instagram or Twitter.